Honey bees area unique among insects. In temperate areas, they spend the winter inside the hive alive and active unlike wasps and hornets that die in the winter or lady bug beetles that hibernate. The honey bee accomplishes its winter-time survival by making and storing a high-energy food, honey. By eating the high-energy food, the worker honey bee is able to generate about 104 degrees Fahrenheit of heat in its flight muscles to warm the colony. Again, the honey bees are unique among insects, which are cold-blooded animals, in their ability to generate heat. The bees use the heat that they produce to warm the center of their cluster of bees. They hold the heat inside the cluster by forming a tight layer of bees on the outside. These bees, which eventually chill, periodically exchange places with bees inside the cluster. The cluster of bees expands and contracts with the outside temperature. The bees don’t waste energy warming the entire hive cavity, only the cluster of bees. The colder the weather gets, the more tightly compacted the cluster gets. As the cluster shrinks, it leaves a surrounding area of empty honeycomb. During prolonged periods of cold weather, the bees often remain tightly clustered; and they don’t venture the short distance to where honey is stored in the hive. Beekeepers often find colonies that have starved with ample stores of honey only inches away from the cluster. The structure of a bee hive makes it quite an effective housing for surviving the harsh elements of winter. Empty cells of honeycomb make excellent insulation, and parallel sheets of comb effectively block winter winds. As the cluster of bees consumes the food stored above them, the cluster moves upward into this space. This upward movement of bees during the winter gives beekeepers an opportunity to move bees from lower frames as I am doing in today’s photo. I am transferring bees from the dark-colored deep hive body into medium boxes filled with honey. Beekeepers have been generous in passing along the craft of handling honey bees. A new beekeeper who attended our local beekeepers association’s introductory short course came by Peace Bee Farm to get some ideas for establishing his bee yard. I explained that the first consideration is always public safety. Bee hives should be placed so that the bees’ flight path avoids areas frequented by people. If bee hives are placed in residential areas, the bees can be directed to fly above people’s heads by placing a fence or hedge in front of the hive. While many bee hives are maintained in backyards and even on building rooftops without problems, the number of hives placed on small residential lots should be limited. After safety considerations, the next important issue for beekeepers is access to the bee hives. Beekeeping equipment is heavy, and it is best to place hives where the beekeeper can drive close to the bee yard any time of the year. 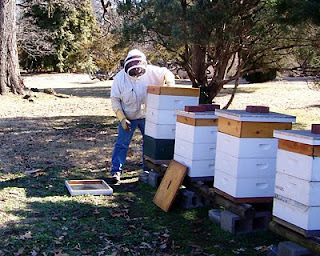 Many beekeepers like to face the hives toward the east or south, so that the sun warms the hive entrance early in day. This causes the foragers to fly earlier, and thus gather more nectar. Many beekeepers like to arrange the bee hives for afternoon shade to help the bees cool the hives in the summer. Others prefer to place the hives in the full sun to lessen small hive beetle reproductive success. Bees kept in wooded areas are often more defensive than bees kept in open spaces. Honey Bees also need a source of water. Without a convenient water supply, foragers may visit swimming pools or other outdoor water sources. Wind screens of evergreen foliage planted to the north and west of the bee yard help block cold winter winds. 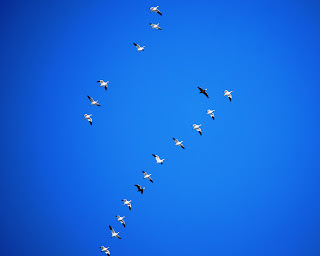 A few snow geese passed overhead today, many have started their migration to their breeding grounds in the arctic. It’s still winter, but birds are migrating; bees are flying on warm days; and brood production has started. Worker honey bees live for about six weeks. The first three weeks of their life are spent doing tasks inside the hive. The next three weeks are spent doing work that involves flying away from the hive. When the bees begin venturing from the hive at about three weeks of age, they start by making a series of orientation flights in which the bees memorize the appearance of the hive and its surroundings. The young bees start their “flight school” in the afternoon by flying in a small figure-eight pattern inches away from the hive’s entrance. As the bees make their orientation flights, they are looking for colors and patterns of shapes. Honey bees can see all of the colors that humans do with the exception of red. The bees can also see ultraviolet, which is beyond our eyesight. The images that the bees memorize involve shapes and patterns of interruptions. After flying close to the hive’s entrance, the bees expand their flight to learn landmarks surrounding the hive. Honey bees at the Children’s Museum of Memphis have no problem finding their hives located among the huge building blocks that spell “CMOM.” In today’s picture from the museum’s blog, www.cmom.com, the museum’s CEO, Richard C. Hackett, is high in the air above our bee hives painting the letter C in pink for breast cancer awareness. To learn more, the museum directs us to www.nbcam.org/about_nbcam.cfm and www.cancer.org/. The always personally involved Mr. Hackett, a beekeeper himself, proposed the honey bee exhibit and offered useful suggestions in the development of the observation bee hive project. 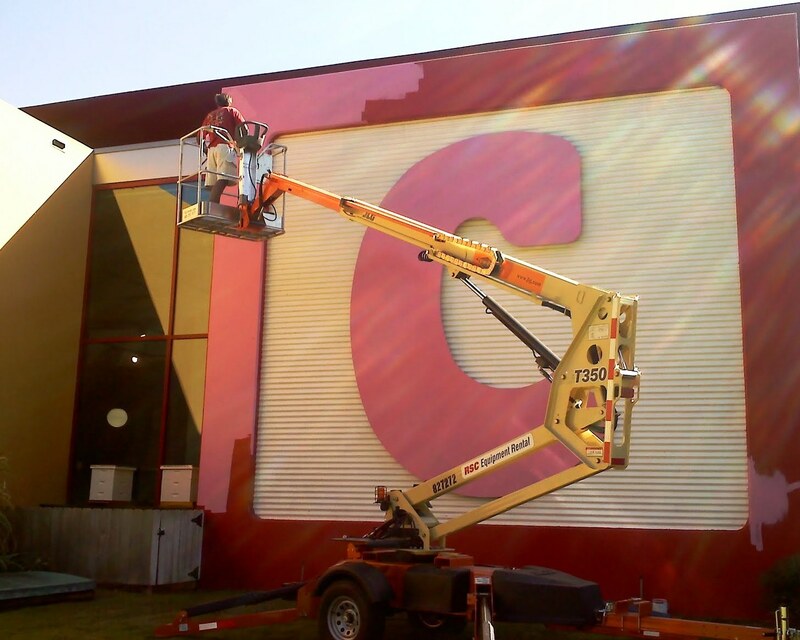 Mr. Hackett swung in close to the bee hives to paint the iconic blocks that make the museum a landmark in the heart of the city. The honey bee exhibit is designed to fit into the museum’s mission: “We create memorable learning experiences through the joy of play in hands-on exhibits and programs.” The museum helps honey bees as well as children expand their view. Much of our knowledge of the honey bee colony’s activity and life cycle is learned using observation bee hives having clear windows of glass or plastic providing a view inside the hive. Regardless of the weather, beekeepers cannot keep a bee hive open for an extended observation without disturbing the bees and adversely affecting the colony. Observation hives allow for long-term viewing with a minimum disturbance of the bees. However, observation hives are usually smaller and are more difficult to maintain than regular, full-size hives. Most commercially available observation hives hold from two to six frames. These smaller hives are more prone to starving, swarming, and being overtaken by Small Hive Beetles. Bees in small hives also have more difficulty in maintaining the hive’s temperature. The Columbia University Beekeeping Club is considering placing a hive outside a campus building. I offered them the details of modified Langstroth hives I maintain at the Children’s Museum of Memphis. 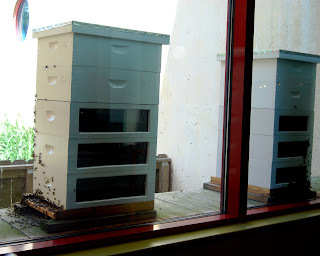 Windows in the side of one hive expose frames of comb, and windows in the rear of another allow viewing between the frames. The hives are placed outside the building as opposed to inside arrangements that use a tube for the bees to enter and exit. With any observation hive it is most important that proper bee space is maintained. In my modified hives, Lexan windows fit flush with the inside surface of the hive bodies. Quite often I see observation hives with windows covered with comb or propolis. Maintain clean windows by providing 3/8 inch spacing between the inside surface of the window and the adjacent frame. Choosing a location for placing the hive is most important. Consider the direction of the sun in relation to the hive. If the sun strikes the observation hive’s glass, the hive will likely become a solar beeswax melter, and the bees will die. I placed my Children’s Museum hives in a North-facing alcove which blocks the afternoon sun. You may view the exhibit at http://www.cmom.com/?q=honeybees. Honey bee colonies typically swarm once a year in the temperate regions. This method of reproduction on the colony-wide basis expands the number of colonies and moves bees into new areas. However, swarming is quite risky. Only about one in five swarms is successful in moving into a new cavity and establishing a colony that lives for several years. Why would a creature adopt a behavior unless it is beneficial in the long term? Perhaps swarming serves an important purpose other than colony increase and range expansion. Moving the colony to a new location, even if only occasionally successful, allows the bees to leave behind old nests. The old nests, built of beeswax honeycomb, are reservoirs of pesticides, chemicals, and toxins found in the environment. The old honeycombs may also hold the reproductive spores of a number of honey bee diseases, namely American foulbrood, Nosema, and chalkbrood. Another purpose is served by swarming and moving into a new cavity. Trees with cavities are often in decline and fall due to structural damage and decay. When the honey bee colony divides itself and swarms, it takes along the old queen. A new queen, or more often a queen cell with a potential queen, is left behind with the remnant of the original colony. While this new queen may successfully mate and serve to provide reproduction in the original hive, this too is not always successful. Still, it appears that the swarming process serves as an effective reproductive strategy. Swarming is another behavior that the honey bee evolved to help ensure the survival of the colony. Other behaviors that the bees use to protect the colony include defending the hive with guard bees and removing dead bees from the hive. Unhealthy bees fly or crawl from the hive to die. At Peace Bee Farm, we regularly remove old honeycomb from our hives to reduce the build-up of environmental chemicals and eliminate spores of pathogens. Today’s photo: burning old brood nest honeycombs. Corn, or maize, is the most widely grown crop in the Americas. A beekeeper asked me if Bt corn and Roundup-Ready corn are dangerous to honey bees. This is among the commonly asked questions as beekeepers are facing annual colony losses of 30 percent. Beekeepers question the safety of chemicals used in the environment and changes in agricultural practices. Bt corn and Roundup-Ready corn are both Genetically Modified Organisms. In Bt corn, a gene is borrowed from the Bacillus thuringiensus bacteria. This modification allows the corn plant to produce its own Bt insecticidal protein. This technology allows for corn production with lesser application of insecticides, as the plant is producing its own insect killer. The effect of Bt corn on honey bees was tested in Germany from 2001 through 2004. Michael Schacker reports in A Spring Without Bees: How Colony Collapse Disorder Has Endangered Our Food Supply, 2008, that Bt crops and GMOs are not correlated with Colony Collapse Disorder. There may possibly be some benefits for bees and other pollinators from the use of Bt technology in corn, as this may lead to a reduction in the use of crop insecticides. Roundup-Ready corn can withstand the herbicide glyphosate. Herbicides, like Roundup, are being tested now; however, results have not been published. Following the appearance of Colony Collapse Disorder in 2007, the effect on honey bee health is questioned for all chemicals used around bee hives. A relatively new class of insecticides, the neonicotinoids, is highly suspected by many beekeepers as being involved in CCD and honey bee health problems. Among these systemic insecticides are imidacloprid and clothianidin. Of particular concern is the effect upon the bees of a less than lethal dose of a neonicotinoid insecticide when combined with certain honey bee viruses or the newly detected strain of Nosema disease. Honey bee colony collapses often occur in the winter. This winter has seen greater than normal snowfalls in the Arkansas Delta. Today’s photo: common starlings weather the snow. Much of the practical training of beekeepers is provided by local beekeeping associations. These groups provide initial introductory courses in beekeeping as well as ongoing training and mentoring of beekeepers. The Memphis Area Beekeepers Association serves beekeepers across West Tennessee, North Mississippi, and East Arkansas. 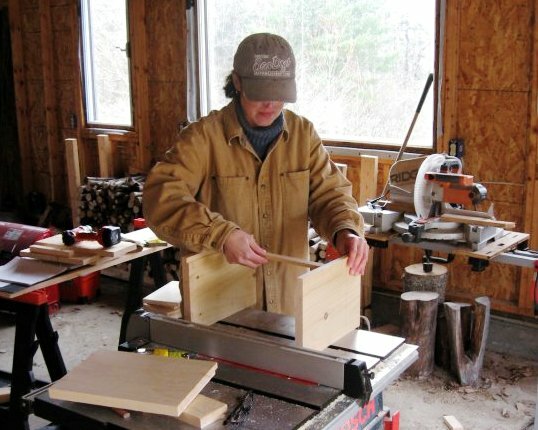 On Saturday, the association will conduct its forty-sixth annual Short Course in Beekeeping. The short course serves as an overview of a broad range of beekeeping topics. The program starts with a description of the equipment and protective clothing used by beekeepers. New beekeepers get to assemble bee hives to get an idea of how to put together these puzzles. Folks are introduced to the honey bee’s life cycle. We discuss where to locate the bee hives and carefully cover how to install the bees in the new hive. The course briefly mentions how we harvest and extract honey. Like other timely topics, this will be covered in greater depth during a monthly meeting prior to harvest. I will address the new beekeepers on honey bee health issues. Since honey bees may be attacked by pests from bears to other insects as well as from bacteria, viruses, and fungi, it is important for new beekeepers to be aware of what the hives face. I will mention the pests introduced into our hives, mostly through world trade, since the mid-1980s: tracheal mites, Varroa mites, small hive beetles, and a new strain of Nosema. I’ll briefly describe Africanized honey bees and Colony Collapse Disorder. The majority of the presentation will be a suggestion for the beekeepers to adopt an integrated pest management approach to beekeeping, relying first on biological, cultural, and mechanical controls of pests. Chemical control measures will be held as last resorts. 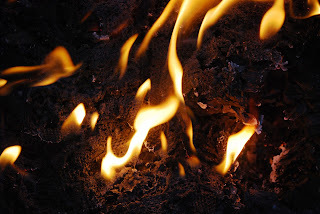 I will encourage everyone to avoid using insecticides and nerve toxins in the hives and to treat American foulbrood with the only sure cure: burning the hives. 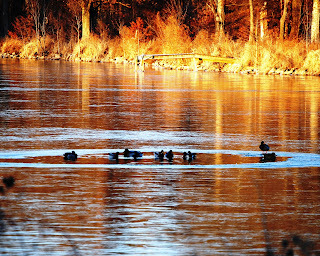 Peace Farm lakes are frozen now; wild ducks circle to maintain small areas of open water. A report published in The New York Times relates that only 28 percent of public high school biology teachers are following teaching recommendations to “describe straightforwardly the evidence for evolution and explain the ways in which it is a unifying theme in all of biology.” Thirteen percent of the biology teachers explicitly advocate creationism, and 60 percent avoid the subject altogether. The Times report: http://www.nytimes.com/2011/02/08/science/08creationism.html?hpw. A beekeeper tries to explain the complexity of the honey bee’s social behavior in a colony that appears to be as organized as a city full of people. He says that such a well-organized colony can only be the result of creation by a higher being of great intelligence, and he struggles to find bee hive examples of what he calls “intelligent design.” There is wondrous activity among these social insects, but the honey bee colony is certainly not perfect. The colony gathers and produces its own food, increases its numbers and expands its territory. It regulates the temperature and atmosphere of its hive. It can even produce a new queen when one is need. However, there are times when the life cycle of the honey bee colony becomes dead-ended. When dealing with a poorly mated queen, an egg-laying worker, or a queen failing to lay fertile eggs, a colony often becomes hopelessly queenless and then dwindles and dies. Rather than the product of an “intelligent design,” today’s honey bee colony can be better understood as the result of millions of years of evolution in a changing environment. Those colonies that inherited traits, altered by mutations, that make them more survivable in the present environment pass along those traits to their offspring. They replace other less suited colonies that either die or are less successful in reproducing. The replacement of less suited species has been seen recently in the evolution of antibiotic-resistant strains of tuberculosis, insecticide-resistant bed bugs, herbicide-resistant Palmer pigweed, and Varroa mites resistant to the miticides used by beekeepers. 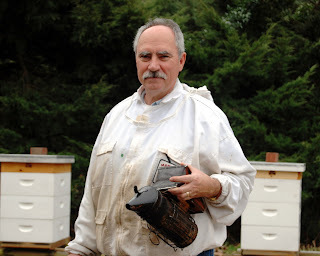 Today’s photo: beekeeper Richard Underhill. Some individuals are attracted to beekeeping’s lack of complicated modern technologies. In fact, most of the great inventions of modern beekeeping occurred in the mid-1800s. They include L. L. Langstroth’s 1851 removable frame hive, beeswax foundation for hive frames, the honey extractor, and the beekeeper’s smoker. While the durable Langstroth hive is the one most widely used to house managed colonies of honey bees, there are others. The Warre hive, pronounced “war-ray,” and the Kenyan top bar hive are two hives that use only wooden bars to support the sheets of honeycomb instead of complete frames. The Warre hive stands vertically and resembles a Langstroth hive in outward appearance. Brood nest and honey storage boxes are similarly stacked atop each other. The unique element of a Warre hive is the upper box, which slightly overhangs the hive. This box has a sloping, vented roof and a canvas floor. The box is filled with straw or other moisture-absorbing material to help control the atmosphere in the hive as well as hold hive scents. Abbe Emile Warre, who developed this arrangement in France and called it the “People’s Hive,” felt that it allowed the bees to control the temperature, humidity, and oxygen and carbon dioxide levels within the hive. With the combs hanging unsupported from top bars in both Warre hives and Kenyan top bar hives, honey harvesting is destructive of the beeswax combs. Most honey is harvested by mashing the comb and draining the honey. Without full support of the combs as in the Langstroth hives, these hives are not well suited for transport. However, both hives are popular with beekeepers who want to provide pollination for gardens or intend to infrequently manipulate the hives. Beekeepers must delicately handle the U-shaped combs that the bees hang from simple top bars. 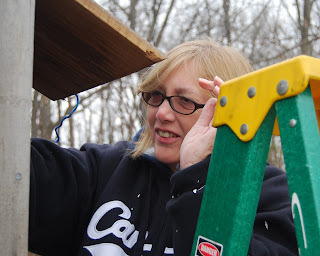 In today’s photo, The Luddite, checks the fit of top bars for a Warre hive she is building. The complete Warre hive can be seen in the February 6, 2011 posting. Backyard beekeeping is expanding in popularity, and it provides many benefits. First, our gardens and plantings of food crops benefit from the replacement of pollinators that have been disappearing in recent years. Another great benefit of backyard beekeeping is experienced by the beekeepers themselves. Planning for adding a couple of bee hives, attending adult education classes or a short course at the local beekeepers association, reading some beekeeping books and journals, ordering a package or nucleus colony of bees, building and painting the hives, and finally installing them in the hives make for an exciting break from any other endeavor. However, beekeeping becomes a true source of involvement of one’s attention once the bees start drawing out their beeswax nest, the queen starts laying eggs, brood starts developing, and we get to observe the intricate activity occurring in the colony. Many beekeepers find the bee hives such a source of interest that they become so thoroughly absorbed in observing the bees and tending to the hives that they are able to completely forget other daily activity or worry. As such, beekeeping becomes a source of relaxation or enjoyment. Many like to sit and simply watch the bees at the hive’s entrance and listen to the hum of the hive. 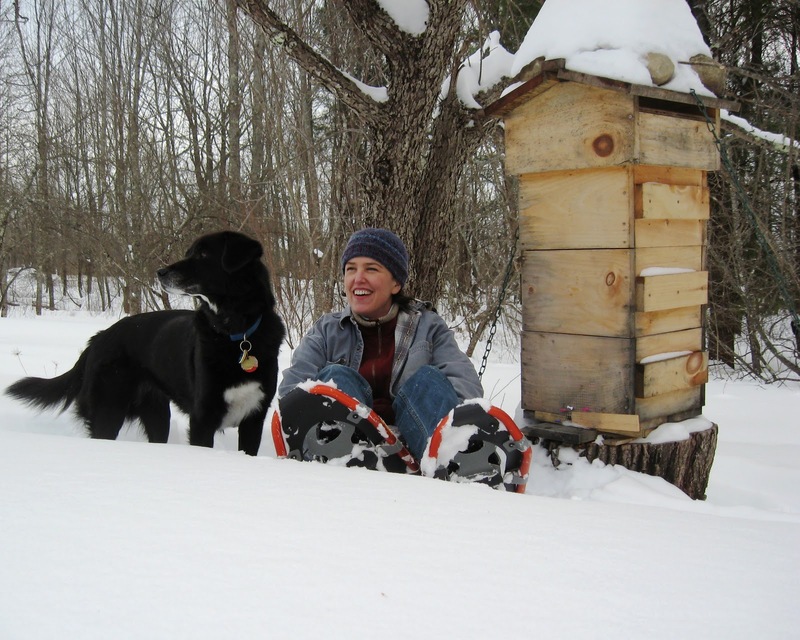 The Luddite, a busy New England Primary Care Provider, finds relaxation with her bees. 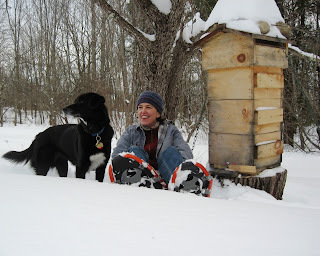 In today’s picture, we see her in snow shoes visiting one of her Warre bee hives accompanied by her “official apiary dog,” Hannah. A Warre is a hive that stands vertically, approximating a hollow tree, the honey bee’s natural home. The Warre hive does not use frames as found in the conventional Langstroth hive. Instead, it employs simple wooden upper supports, similar to those used in a Kenyan top bar hive. The top of the Warre hive is comprised of a box filled with straw or other absorbent material. This box, used to control hive moisture is separated from the brood nest by canvas. The Luddite looks care free. One of our guiding principles at Peace Bee Farm has always been simply stated as, “we work with nature.” We try to provide our bees a hive that is similar to their natural nest in a hollow tree cavity. We seek to find natural solutions to problems and encourage healthy relationships. Natural predators of honey bee pests are encouraged. Rats and mice serve no good purpose in bee hives, and they are particularly worrisome in agricultural regions after the crops are harvested. Hawks and owls are effective predators of rodents. 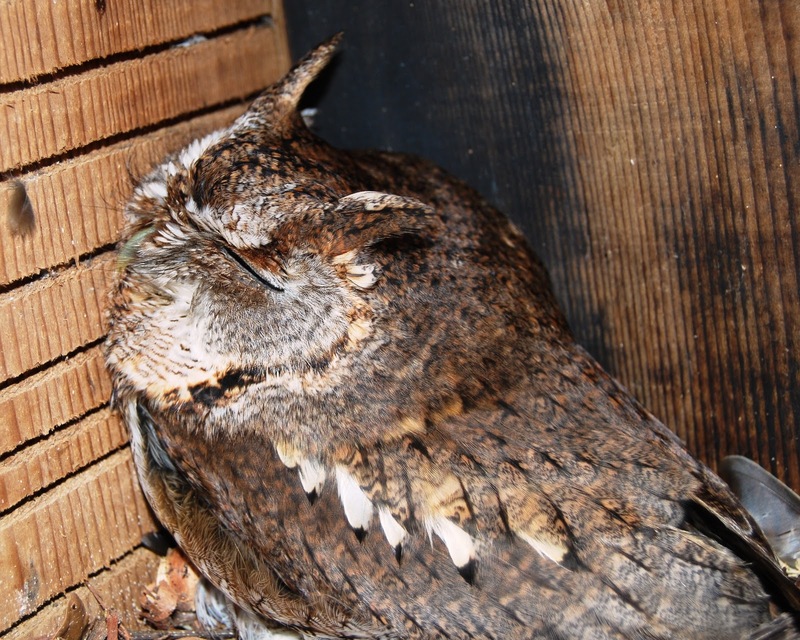 Screech owls are welcomed occupants of wood duck nesting boxes located around the lakes on the farm. These small owls are on duty every night throughout the year catching mice. In today’s picture, Rita is touching the sleeping owl she photographed in yesterday’s posting. We place fresh nesting material in wood duck nesting boxes for the birds to use in March and April. The reclusive wood ducks will be seen briefly with the adult female after they leave the nesting boxes. During the day, marsh hawks sail low across the ground and red-tailed hawks perch from a high vantage point. Both are ready to swoop onto a rat or mouse. Migrating hawk numbers peak in the winter, but some hawks remain around the year. Snakes take over much of the rodent control duties in warm weather. We provide cover for black rat snakes and speckled king snakes near our bee hives. Impressively large common water snakes abound the lake banks. Bats, living in cavities of trees, fly at night when wax moths are active. Even inside the bee hives there are naturally occurring relationships between predators and prey that can be encouraged. Ants eat parasitic Varroa mites when they fall through screened bottom boards onto the ground. Each of these predators: hawks, owls, snakes, bats, and ants play a role in helping control pests of the honey bee hive; and they work tirelessly. All they need is a little protection. Another opportunity arises for anyone to serve as a citizen scientist on the upcoming Great Backyard Bird Count. Each year the four-day bird count is held in mid-February on the leading edge of the bird migration season. 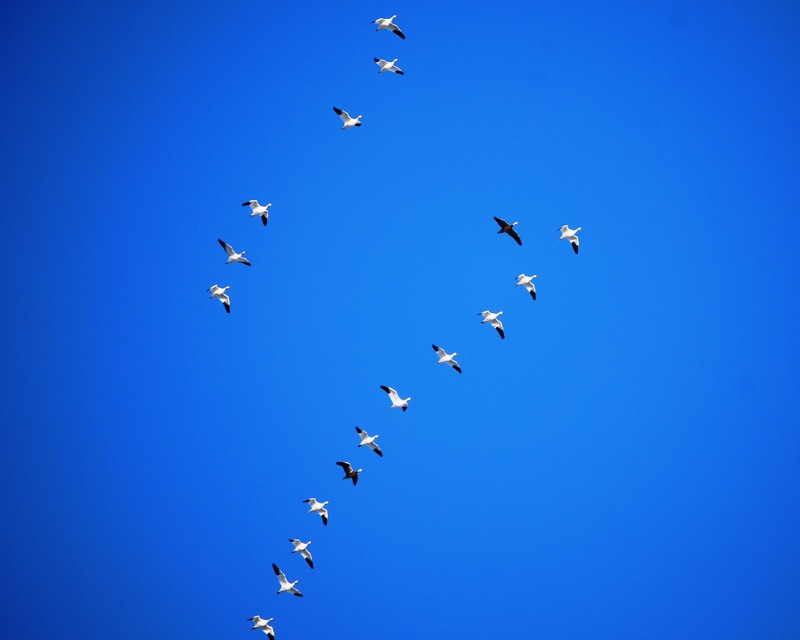 Counting birds simultaneously across the continental US, Hawaii, and Canada, scientists follow trends in population numbers and bird migration patterns. 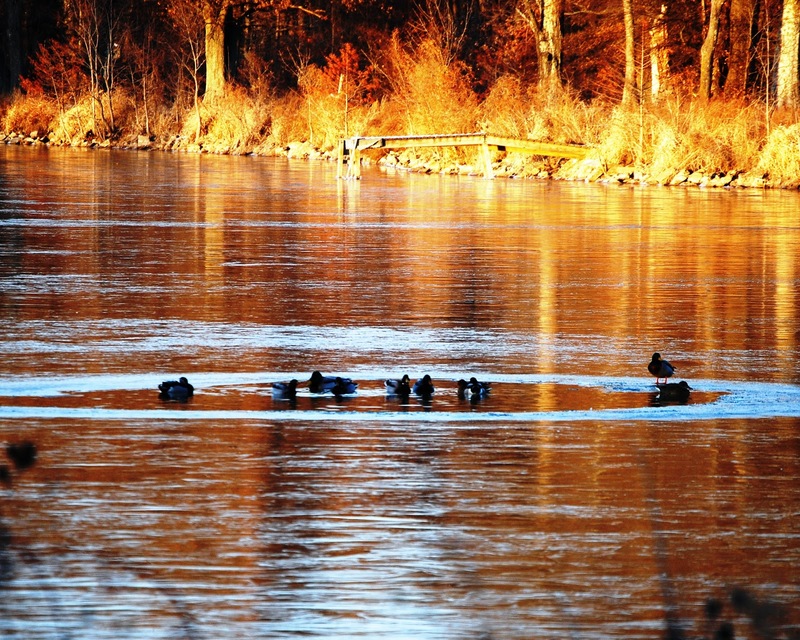 This year’s bird count will be conducted February 18 through 21. Participation information and results of previous bird counts is at www.birdsource.org. This past year participants from the 50 US states and Canada’s 10 provinces and three territories found 602 species of birds in 11 million observations. The most observed bird was the American robin. The Canada goose, snow goose, American crow, and European starling followed. Some rare bird observations were made in 2010. A new species was sighted off the coast of San Diego; and a finch was found in Ontario, Canada far from its native range of the Rocky Mountains. 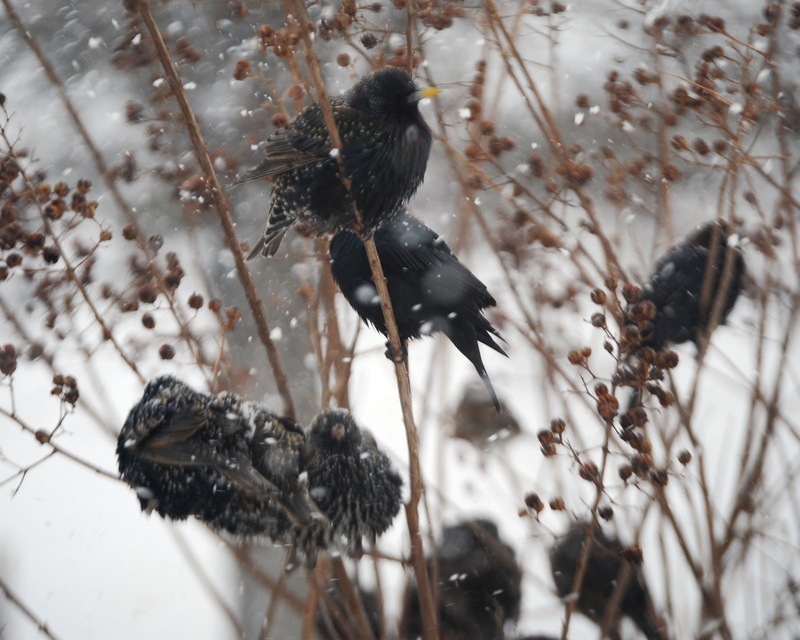 The Great Backyard Bird count is effective in monitoring population trends. In 1999, one thousand Eurasian collared doves, immigrants to Florida from the Caribbean, were observed in nine states. Last year, 14 thousand doves were found in 39 states. I first spotted these new doves in my backyard about three years ago. Larger than mourning doves, these unwary doves with a dark ring marking the neck often hold steady for easy viewing. Experts review the checklists of bird observations, and computer analysis helps detect errors. For example, last year I reported seeing several hundred herring gulls. The program flagged this as an unusually large number of sightings of this species for Arkansas in February. They asked me if I could verify my sighting. Indeed the birds were ring-billed gulls. Today’s picture shows a screech owl squinting in the sunlight. Rita and I found three of the small owls living in wood duck nesting boxes here on Peace Farm. I’ll dust off my binoculars and camera for the Great Backyard Bird Count. Mark Leech, of Tasmania, Australia, writing about urban beekeeping, questions how Peace Bee Farm arranges its hives at three locations in the city of Memphis. Answering Mark’s questions about our urban bee yards reveals some interesting details. We discover that the nectar sources, the timing of the nectar flow, and the amount of honey produced varies within the city. Our bee yard located in the Memphis Botanic Garden produces honey earlier than the other locations and produces several distinct flavors of honey through the year. The area contains specialty gardens and a great diversity of flowering plants and trees. The surrounding residential neighborhoods contain flower gardens and numerous chemically treated lawns. A nearby golf course offers limited forage of clover. Observation hives a few miles away at the Children’s Museum of Memphis produce some surplus honey, even though they are primarily managed for viewing the bees and honeycomb. The older neighborhoods surrounding the museum offer wildflower forage in untreated lawns, vacant lots, and along railroad lines. Today’s picture shows the view from our bee yard located in the rear of the Hunt-Phelan Home facing historic Beale Street in downtown Memphis. Even though the downtown area is largely paved and covered with buildings, the bees have access to trees and forage areas along the Mississippi River. Urban areas provide surprising amounts for forage for honey bee hives. The amount of honey produced may vary according to the neighborhood. Weedy areas and gardens often produce significant amounts of nectar and pollen. Carefully tended lawns, golf courses, office parks, and paved parking lots, however, are virtual deserts to honey bees and native pollinators. 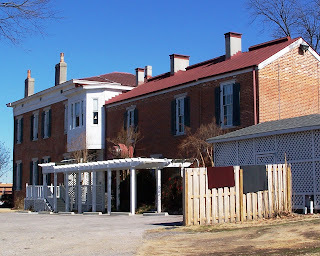 The Hunt-Phelan Home, completed in 1832, was designed by Robert Mills, architect of the Washington Monument, the US Treasury building, and part of the White House. The home has hosted US presidents Andrew Jackson, Andrew Johnson, Ulysses S. Grant, Grover Cleveland, and Martin Van Buren. Confederate president Jefferson Davis was a frequent guest in the home. View Hunt-Phelan at http://huntphelan.com/.